Some of the most interesting things grow in the beautiful, living Sonoran Desert. In the midst of the diverse plant and animal life, and the magestic saguaro cactus, blooms the creations of Joanne Livingston. 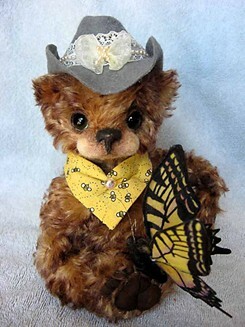 At home in Phoenix, Arizona, surrounded by mountains, Desertmountainbear evolved out of the inspired desert and western themes, scattered throughout the area. Even the names of the Arizona towns make their way into Joanne's creations. 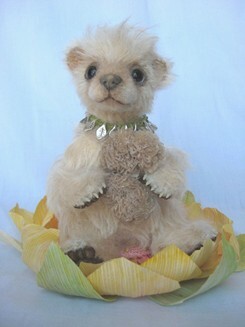 Joanne Livingston began making bears in 1987. "At that time I was making and selling Santa Clauses at a craft show. A lady in the booth next to me sold her bears. This was near the beginning of the artist bear movement, and I had never seen anything like this." 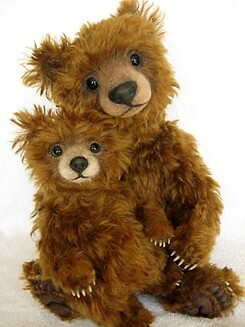 Joanne knew from the moment she saw the bears, she would make bears. 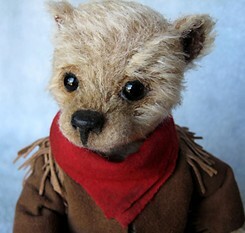 Starting under the name Livingston Bear Company, she sold many bears and Santa's at juried craft shows in Pennsylvania where she lived before moving to Arizona. In 1993, her daughter Anna was born. 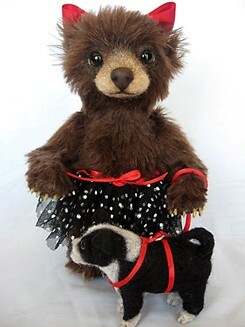 This was before the internet, and she knew that she would no longer have the time to make as many bears as she needed for shows. "So I packed all my bear-making supplies and put them into storage; waiting for the time to come when I would have time again to create." Unfortunately the storage locker was robbed. "All of my supplies, the mohair, eyes, joints, and real fur for the Santa's were stolen. I thought this was the end; so many years of collecting gone and I knew it would cost a fortune to replace everything. So I threw away all of my patterns." Despite the tragedy, Joanne is a firm believer in the power of positive thinking. "I believe that if you ask, you will be given." "As my daughter got older, and I started to have more time to myself, I began to want to step back into the craft market again." "I didn’t know how I would began to open myself to the possibilities that would present themselves to me." In early 1997, Joanne was looking at advertisements on Craig’s List; a daily Internet classified posting web site when she spotted an eye opening ad. 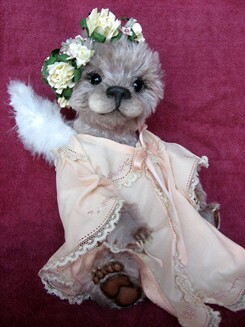 To her surprise a gentleman in the Phoenix was selling his wife’s teddy bear supplies. "I almost cried when I saw that his wife's collection contained the replacements for everything I had lost. 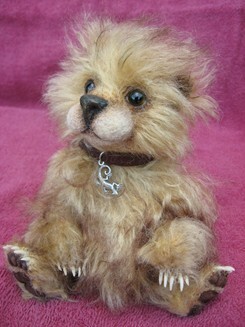 The mohair, eyes and joints - it was all there. I purchased everything, and I began again." 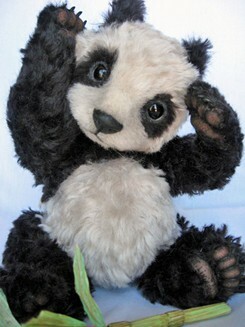 Surfing the online auctions to see what types of bears were selling, Joanne noticed that the teddy bear market had evolved. 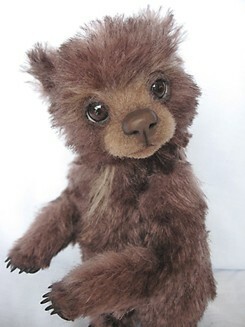 Now artists were creating more life-like bears. "This absolutely inspired me. 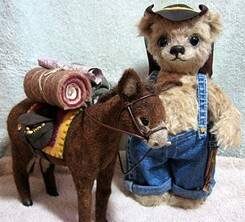 I knew that I didn’t want to go back to the traditional teddies of my past. 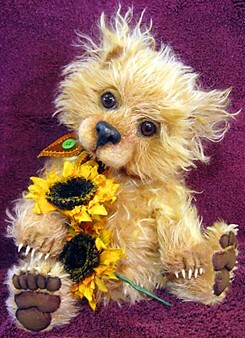 I needed to make bears that looked alive!" calling on her experience as a hairstylist, she put her haircutting and color knowledge to work. 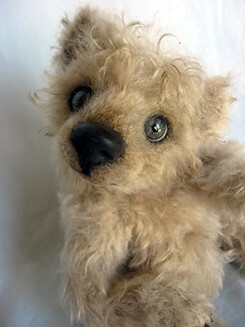 Working mainly with mohair, Joanne starts each bear with a new pattern from scratch or reworks an existing pattern so that no two bears are ever alike. 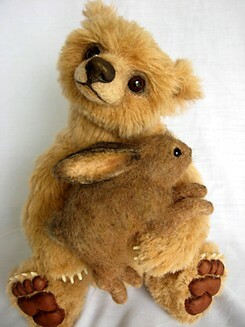 She uses leather for the feet creating a more realistic look, gives her bears claws, she needle felts the muzzles, eyelids and noses and then uses pure bee's wax on the noses. 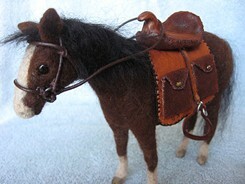 "I love to needle felt the muzzles because I can make them the exact shape I want them. By adding the fur, I can cut it short like a real bear’s muzzle. I can make it any color I wish, and I can make it “grow” in any direction." "The fur on the muzzle is mohair that is pulled from another piece of fabric. It is then firmly rooted with a felting needle strand by strand into the muzzle. This takes so much time, but to me the possibilities are endless, and exciting." she said. Joanne sells her bears mainly using online auctions, but hopes that her web site will provide a more direct avenue for sales. "At this time, bears are not a full time job." She teaches 5th and 6th graders to become better readers, all while enjoying their creative nature. But now with her daughter getting older and not requiring as much of her time, her goal is to spend more time designing and making her bears. "That is where my heart is. As I said earlier, I practice positive thinking and I believe that your life is a direct consequence of your thoughts. So when I go to bed each nigh, I am thankful for the blessings and inspiration I have received. I tell myself that tomorrow inspiration will come. I will follow its path." The inspiration does come and so, she follows.